Montpellier, France, in the seventeenth century. Montpellier is an old city in southern France. It stands about halfway between Marseille and the Spanish border along the Mediterranean Sea (strategically located slightly inland to avoid pirates). First documented in the tenth century, it is one of very few French cities that developed without the influence of ancient Roman occupation; it is a pure product of the local region. It became a center of intellectual learning and attracted students from throughout Europe. Around it sprung a number of supporting arts not the least of which was glassmaking. Once famous for its fine glassware, today this centuries long heritage is all but forgotten, yet when we dig into the literature, we find a surprise connection to one of the oldest legends in the history of glass. Since before the Renaissance, Montpellier was an established center for medical and legal education, a strong tradition that continues at the university there; today, it houses the oldest running medical school in the world. 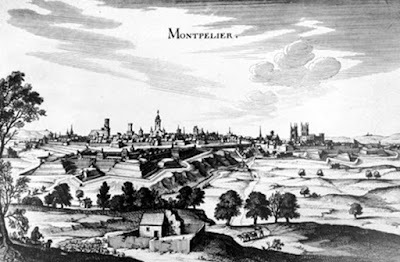 This prestigious institution "was founded perhaps by people trained in the Spanish medical schools; it is certain that, as early as 1137, there were excellent physicians at Montpellier University." In 1529, Nostradamus entered to study for a doctorate in medicine, but shortly thereafter, he was expelled when it was discovered that he previously worked as an apothecary; a 'manual' skill that was banned by the school's rules of conduct. Paradoxically, these impugned 'manual' arts account for some the region's more intriguing activity. Along with medicine, the area became known for the production of paint pigments, for glassmaking and finally for alchemy. All of these turn out to be closely related to each other, but perhaps not obviously so. Throughout the Renaissance, apothecaries were responsible for a wide range of distillations and extracts used by physicians to treat disease. They were also the de facto suppliers of pigments and other fine art supplies and even sourced some of the materials for glassmaking. Glassmakers often relied on painters to embellish their products, painters used ground glass in their pigments and apothecaries needed glassmakers to produce the flasks, beakers and other alchemical equipment required for their profession. Fabre's first book, of a total canon numbering sixteen volumes, was on the subject of alchemy and medicine titled "Palladium spagyricum" 1624. The book, written in Latin, contains advice on the transmutation of metals, turning water into "good wine" and elixirs to cure all disease. 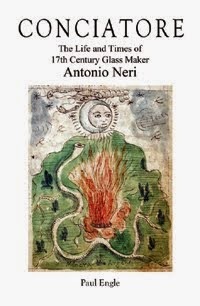 It contains one recipe that is of particular interest on the subject of glassmaking; a malleable form of glass, known in legend since the Roman Empire as Vitrum Flexile. See my previous post to take a closer look at Fabre's specific recipe for a glass that is malleable at room temperature and trace a bit of the legend's history. Wikipedia, “University of Montpellier” https://en.wikipedia.org/wiki/University_of_Montpellier. Mark Clarke: Mediaeval Painters' Materials and Techniques: The Montpellier Liber diversarum arcium (London: Archetype Publications, 2011). Montpellier 1536, MS. H. 486: Recette per fare vetri colorati et smalti d’ogni sorte havute in Murano 1536, Bibliothèque de l'Ecole de Médecine de Montpellier, see also Zecchin 1987, v.1 p 247-276. Although the manuscript is dated 1536 it is probably copied from much earlier Venetian sources. Ed Ward, Blog: City on a Hill, 1 Nov. 2010 post “Where the Glass-Blowers Were.” http://wardinfrance.blogspot.com/2010/11/where-glass-blowers-were.html . Also see Halle du Verre regional glass museum website http://www.cc-grandpicsaintloup.fr/-Halle-du-verre-.html . Paracelsus (1493-1541) was a Swiss born physician and alchemist who looked to nature rather than ancient texts for remedies to disease. He was widely condemned durring his lifetime but became very popular after his manuscripts were printed in the late sixteenth century. The definitive reference on Fabre is Bernard Joly: La rationalité de l'alchimie au XVIIe siècle (France: Vrin, 1992), pp. 35-50. A good English treatment can be found in Allen George Debus: The French Paracelsians: The Chemical Challenge to Medical and Scientific Tradition in Early Modern France (Cambridge: Cambridge University Press, 2002) pp, 75, 76. Pierre-Jean Fabre: Palladium spagyricum Petri Ioannis Fabri doctoris medici Monspeliensis ... (Toulouse: Bosc, 1624), p. 276. Later translated into several English editions, notably by William Salmon: Polygraphice: Or the Arts of Drawing, Engraving, Etching, Limming, Painting … (London: T. Passenger & T. Sawbridge, 1685), pp. 598, 599.